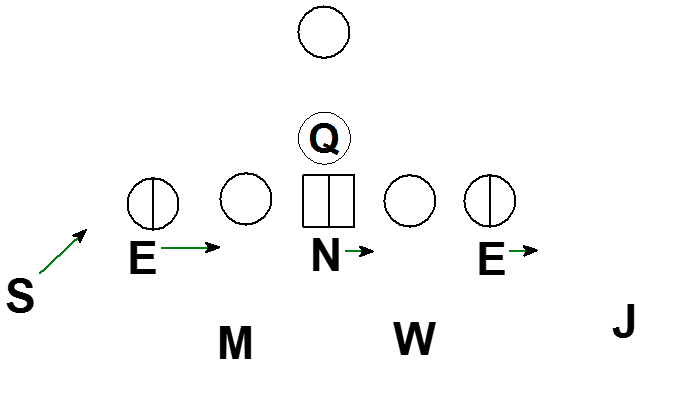 Here is a basic pressure with the defense sending the Sam OLB and rushing the 3 down linemen to create a 4 man line concept from a 3 down line personnel. The defense has several options about how to execute this call. 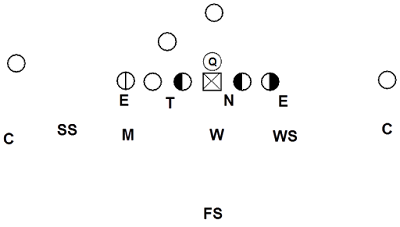 One option for the defense is to have the 3 DL play a 2 gap technique. 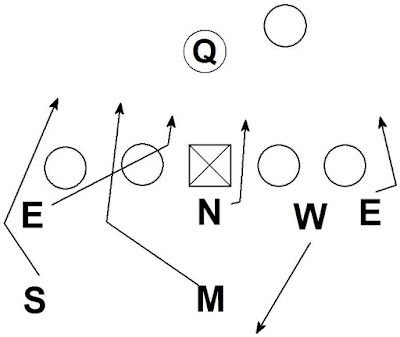 The LB makes a Right/Left call to tell the DL where the extra rusher is going. Here is a Left call. Against the run the DL plays a 2 gap technique. 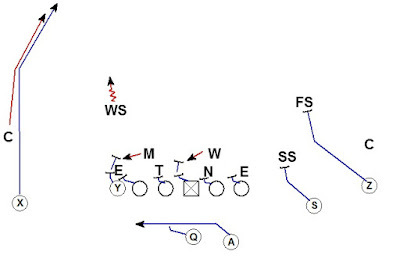 Against the pass the DL will work to pass rush lanes based on the Right/Left call. 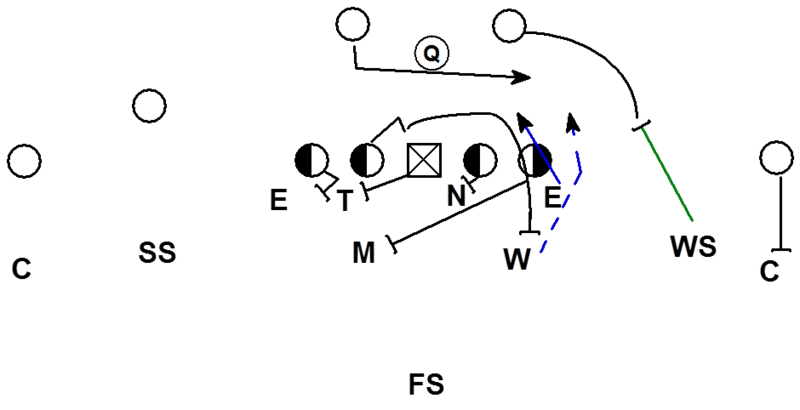 In this example the rushing LB is coming from the left. The left DE will work an inside pass rush lane vs. the pass. The DE has a 2 way go vs. the guard. The Nose will work to the inside rush lane opposite the call. The Right DE will work to contain. 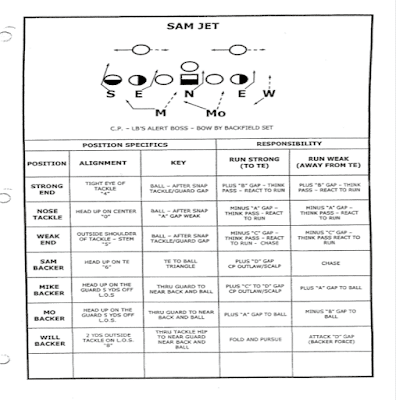 You can see this style of pressure in the 2008 Nick Saban Alabama Playbook. 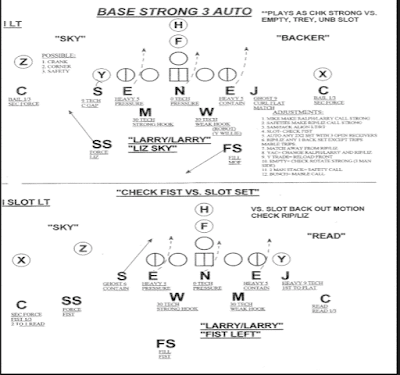 In the Alabama system the LB sets the pressure with a Ralph/Larry call. The DL play the Base front vs. the run which uses 2 gap technique. 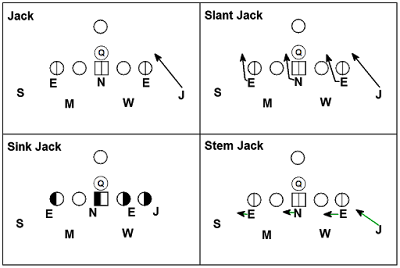 Some teams choose not to play a 2 gap defensive line technique and instead slant the DL to a 1 gap technique. 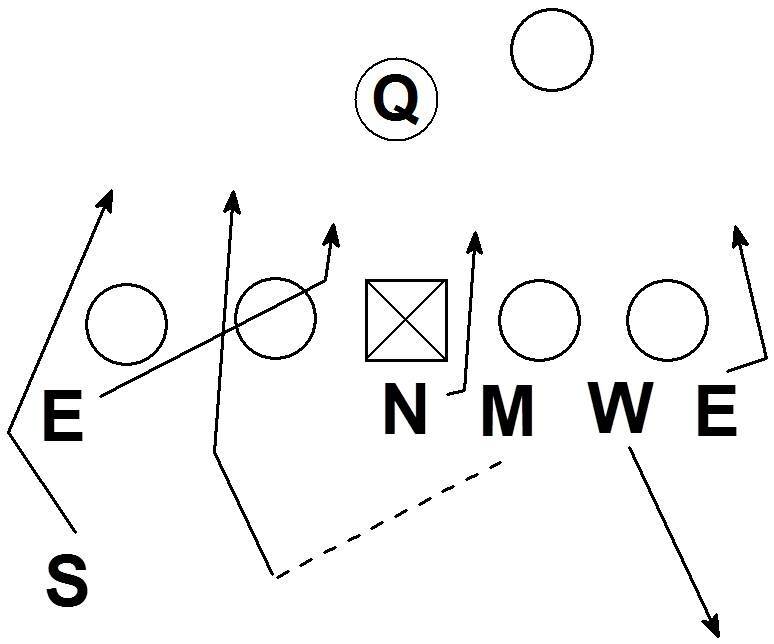 Here vs. the run the DE slants to the B gap, the Nose slants to the away A gap, and the away DE slants to the C gap. Against the pass the slant technique plays exactly like the 2 gap technique. 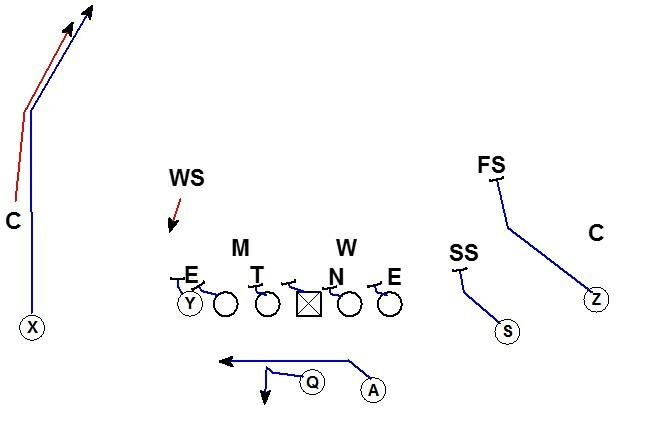 You can see this slant style of 1 gap technique in the playbook of Wade Phillips. The defense can also elect to reduce the rush to where they will be going and align in a 4 man line look. 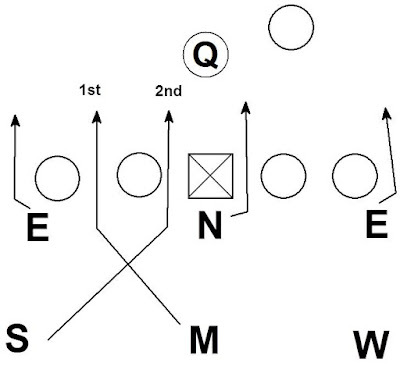 Against the run the front plays exactly like it did when the DL slanted. 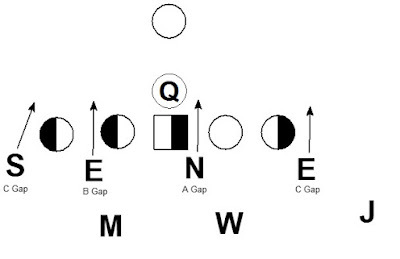 The difference is the DL is aligned where they are going and play directly into their gaps. The pass rush lanes remain the same. 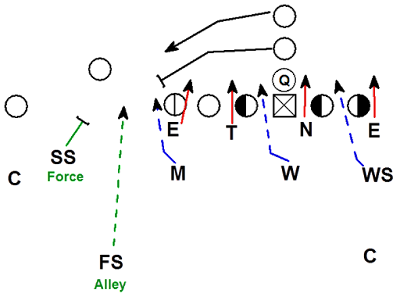 This concept is also in the defensive playbook of Wade Phillips. 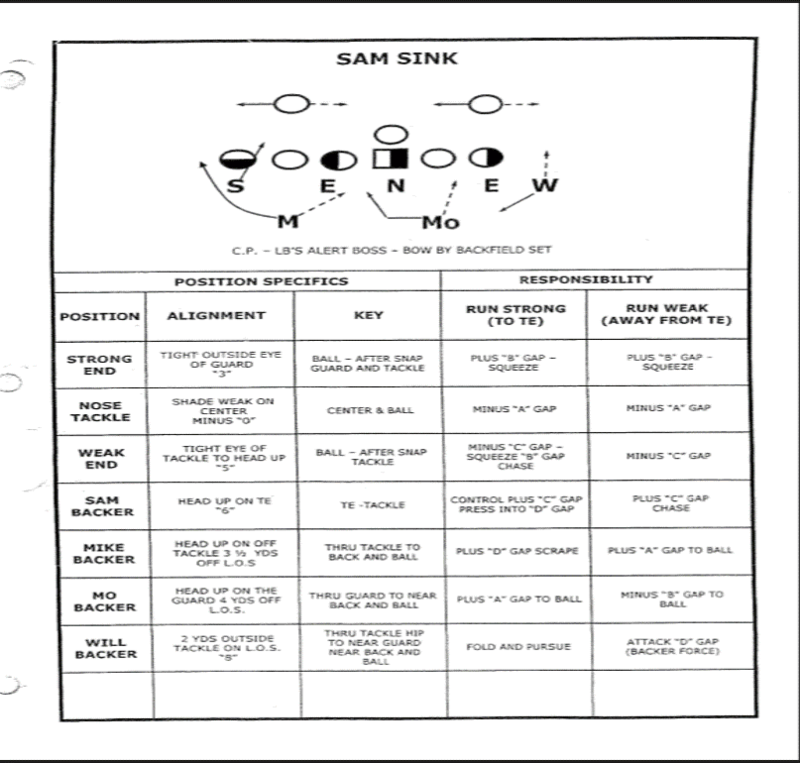 The defense can also choose to stem the DL from the base alignment to a reduced (Sink) alignment pre-snap. 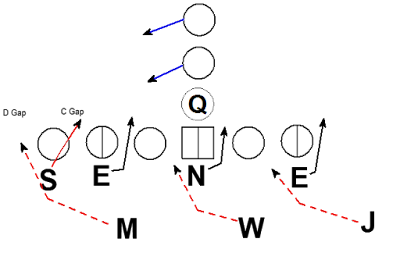 The front starts in a base 3-4 look and stems during the QB's cadence to a 4 man line alignment. The end result is the reduced front. 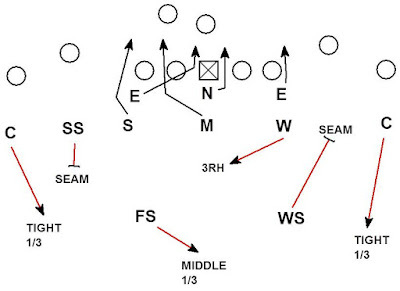 Stemming forces the offense to react to the new alignments during the cadence. 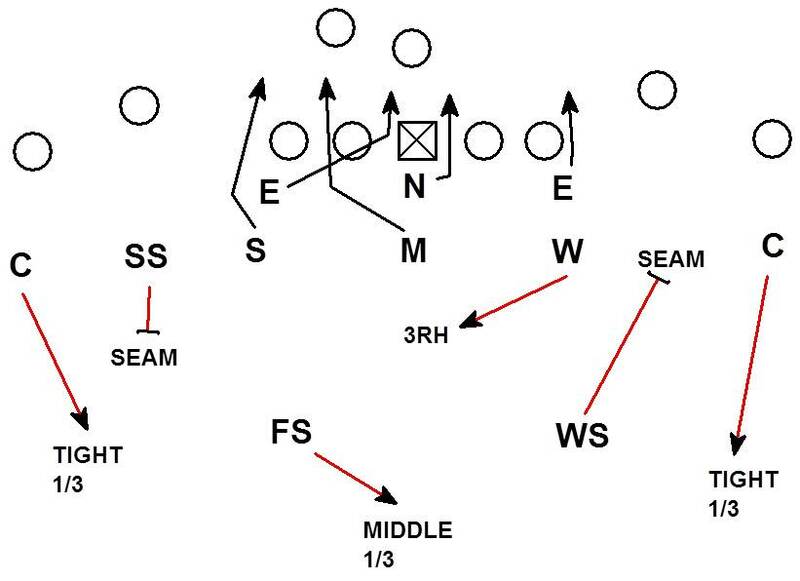 All of these concepts can be accomplished while blitzing the Jack OLB as well. 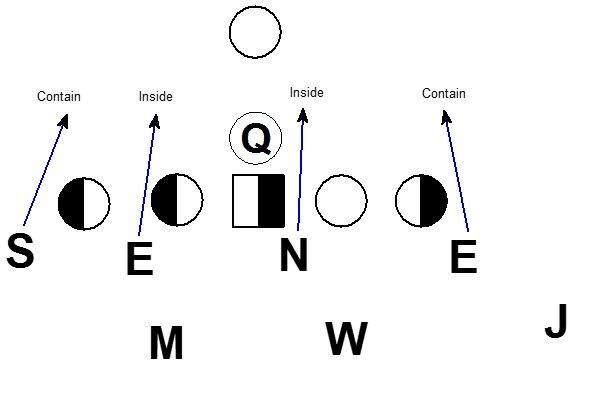 A defense can elect to have any or all of these concepts is their playbook. Having more than one option can help the defense deal with some problem areas. Slanting can be very effective. However, there are times when slanting the DL can be a challenge. 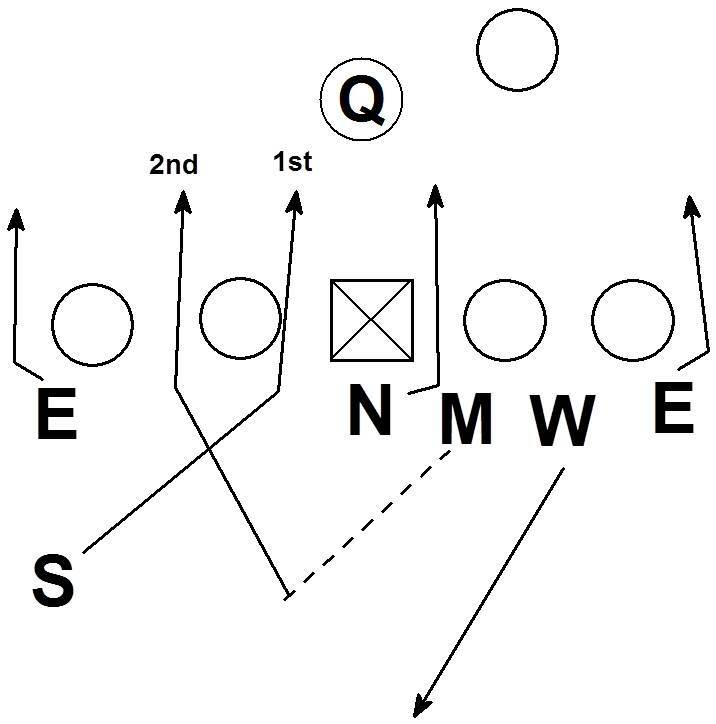 Against a gap scheme run play like power slanting can create issues. The DL in this example is slanting where the OL is down blocking. 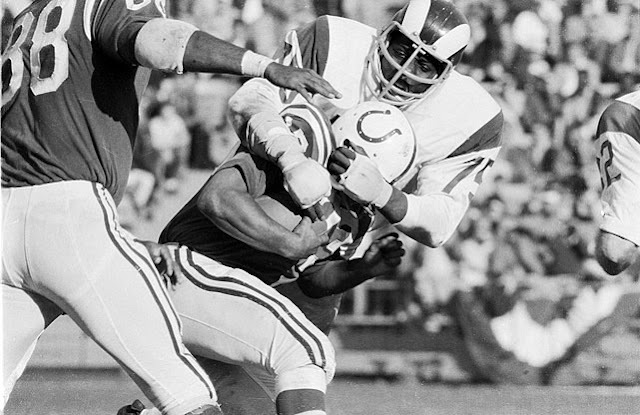 The DL may be athletic and powerful enough to avoid being washed by the down blocks. 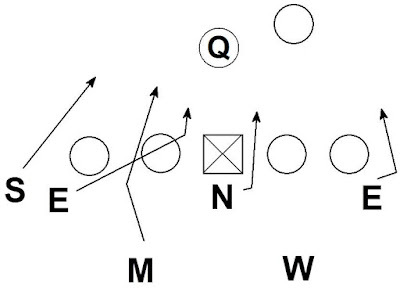 However the DL may get washed creating big seams for the RB to run through. 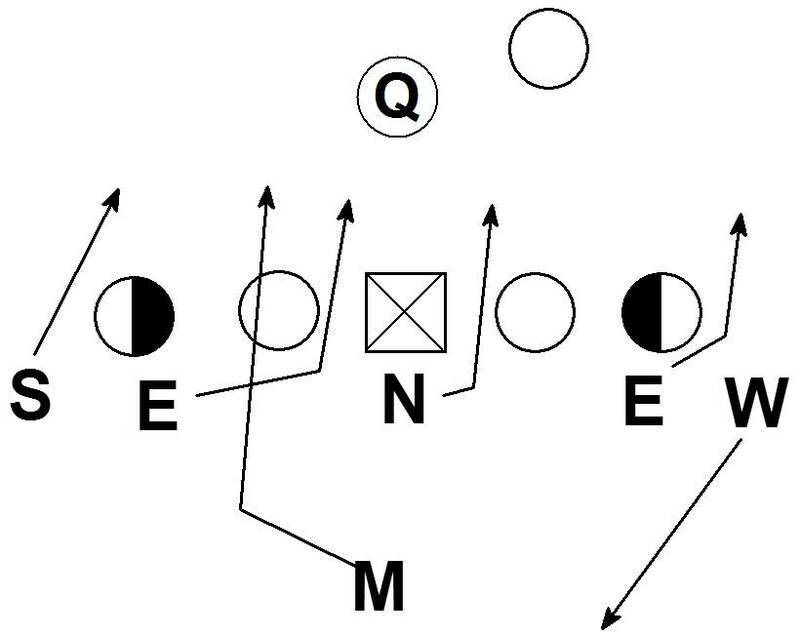 Another challenge when slanting is being able to deal with an OL that reduces their splits. 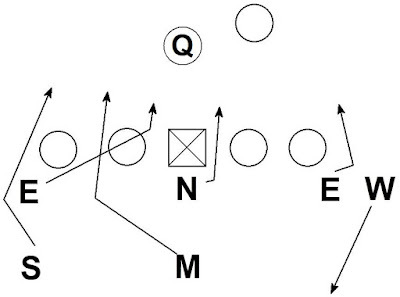 In this example the OL is running outside zone with 6 inch splits. 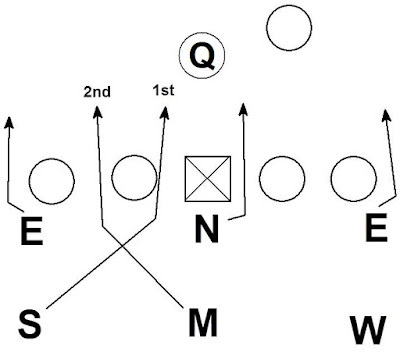 The issue is there is little to no space for the DL to slant to. 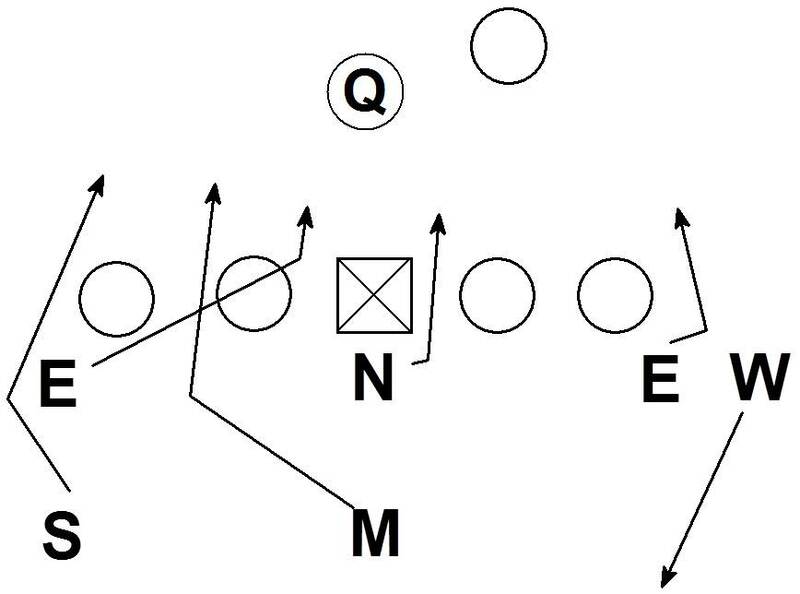 Again an athletic and powerful DL can redirect off the zoning OL and make plays. 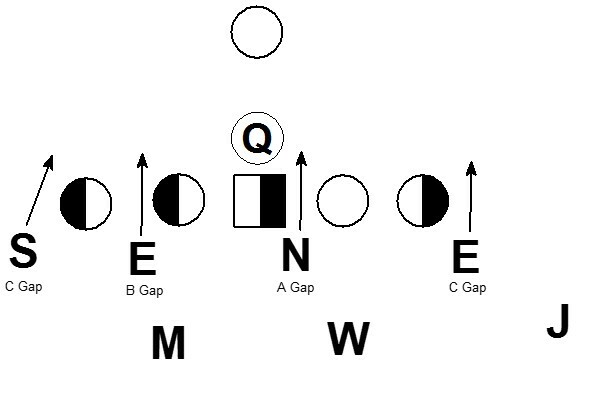 However sometimes the DL is reached badly due to the tight splits and the defense has gap control issues. In both of these situations being able to mix in 2 gap, sink, and stem concepts allows the defense to keep making a base call without slanting. Having all the options available can help the defense have a multiple plan and make in game adjustments based on what the offense wants to run. 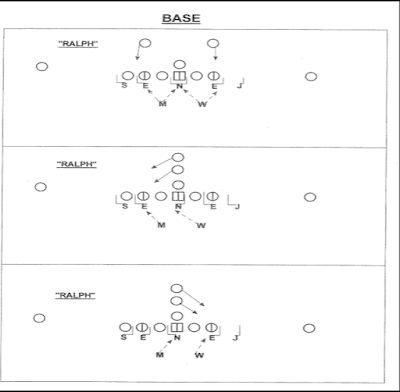 Another reason to consider having multiple ways to execute a basic rush is due to variations in defensive personnel. On non-scholarship rosters the defense may have a wide variance in skill and talents among the DL. The majority of the DL may be athletic slanter types. But if you have 300 lb Nose who can't slant you are going to find a way to get that kid on the field. One solution might be to mix and match techniques. Here the DE's are athletic players who can slant. The Nose is big and not a slanter. On the call the Nose stems pre-snap and plays the A gap without slanting. If the backup nose is an athletic slanter he can slant like normal but the big Nose will stem. Having versatility in a call's technique allows the defense to put players in position to succeed and allows the defense to play the most talented players. 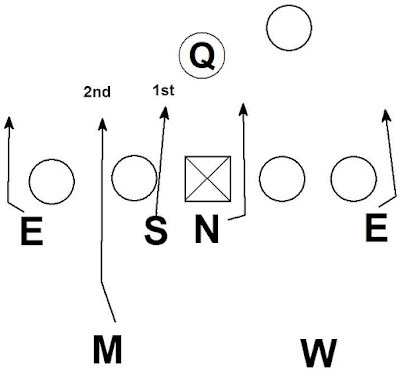 Another choice the defense has to make is how the blitzer will play a TE. Again looking at Wade Phillips defense the rushing OLB can play inside or outside the TE using an Indian or Outlaw concept. 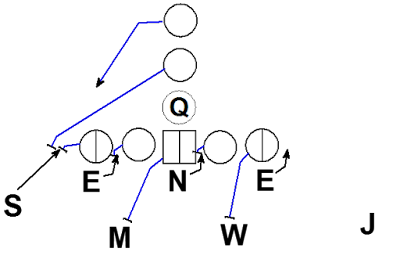 On the indian technique the rushing OLB (Sam) plays inside the TE into the C gap. 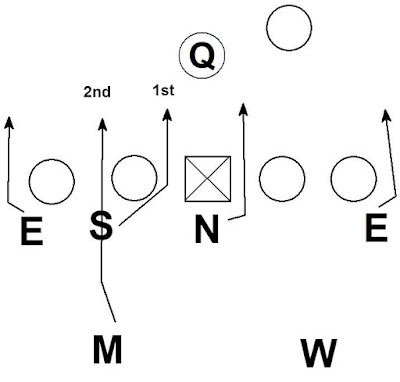 The ILB (Mike) plays over the top of the Sam to the gap on flow to the TE. On the Outlaw technique the rushing OLB (Sam) plays the D gap and the ILB (Mike) plays the C gap on flow to the TE. 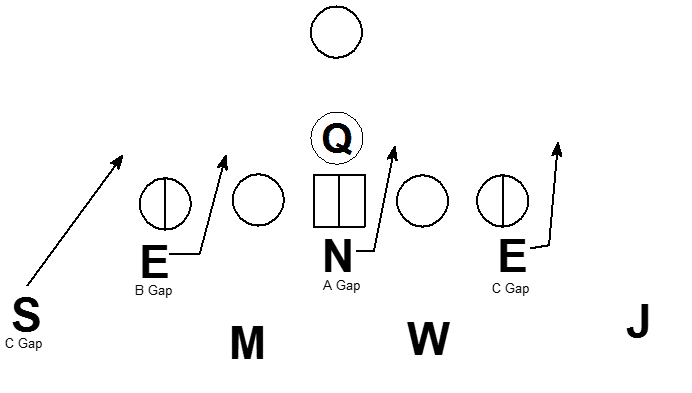 While the concept of rushing an OLB in the 3-4 is simple there are multiple choices the defense can make to help make a basic call more versatile. "4-2-5 is just a 4-3 using nickel sub personnel on every play, so you fit like the 4-3?" My answer is "Yes" to both. Part of the reason the 4-2-5 is popular is that it can fit the run like a 4-4 or like 4-3. Teams can tailor the fits to their needs. Take for example a basic two back 21 personnel pro formation. The defense can align and fit the run like a 4-4. The SS and WS play force while the four down linemen and two inside linebackers account for all the interior gaps. The defense can choose to fit the run like a 4-3 with a safety filling the role of the third linebacker. 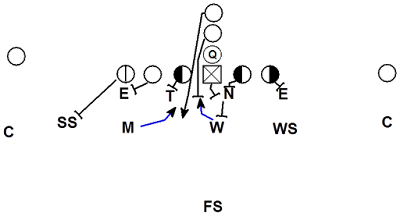 In this example the defense bumps the linebackers (Mike & Will) strong and bumps the WS into the box in the role of the third linebacker. 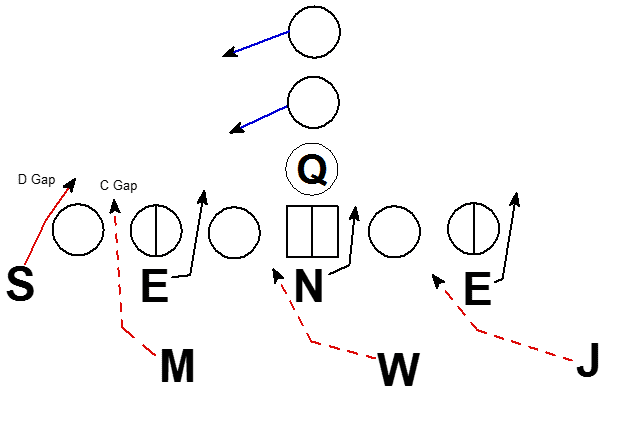 Against a strong or weak flow running play the Mike, Will, and WS fit the run like a Sam, Mike, and Will in a traditional 4-3 defense would fit. The defense can alternatively choose to bump the SS into the box and the linebackers weak. The SS, Mike, and Will then fill the role of the three linebackers. Lastly, the defense can drop the FS down into the box to fill the third linebacker role. 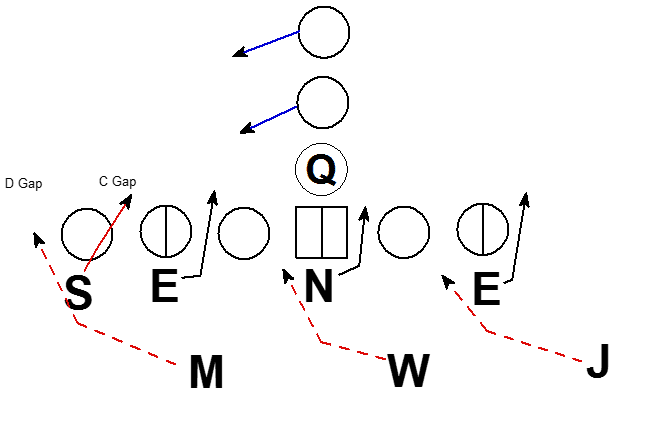 How can a defense use this multiplicity? Here is a standard Iso or Lead play from a 21 personnel Pro I formation. 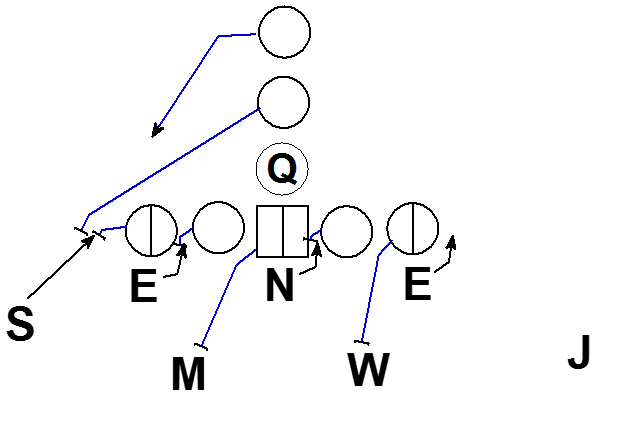 If the defense chooses to fit this play like a traditional 4-4 defense, it can become a stress play. In this scenario the Mike LB fit the FB on the outside half. If the inside linebackers are expected to bracket the fullback, the Will has a difficult job. The Will needs to align wide enough to keep leverage on the guard in case the offense is running an outside flow run weak, like outside zone. This prevents the Will from cheating his alignment too far inside. The result is the Center and Guard can scoop the Nose up the Will, potentially cutting the Will off from his bracket responsibility. One alternative solution is to have the Mike spill the fullback. 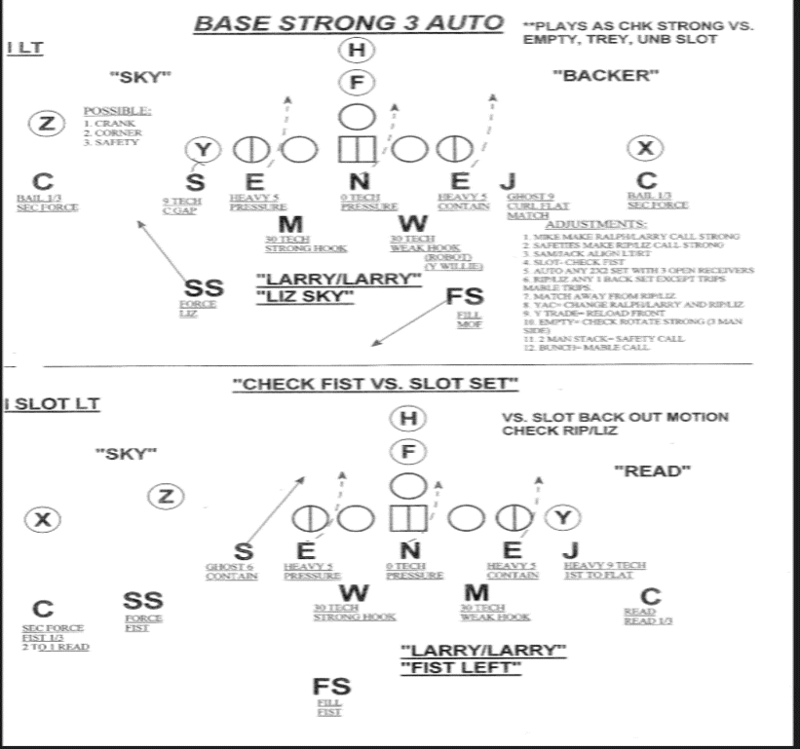 The Will LB's job is easier because he doesn't have to bracket the FB with the Mike. The new challenge is if the Mike is fitting inside of the fullback's block, who is fitting outside? 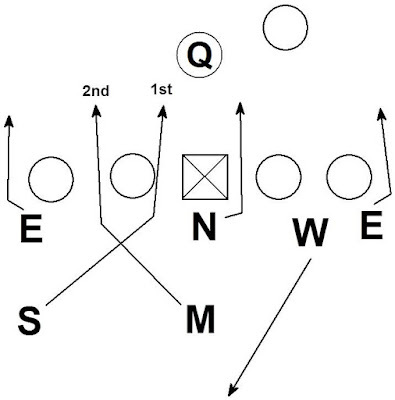 The offense has a good angle to use the TE to block the SS from folding into the box. That leaves the FS. The FS can make the tackle but not without issues. The RB vs. FS may be a bad match up. The FS may have to make an open field tackle vs. a full speed RB. 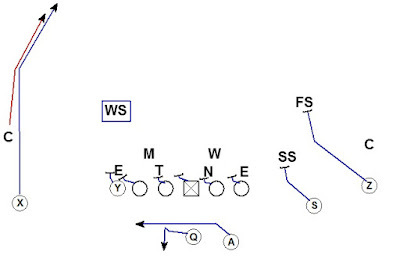 Requiring the FS to be hyper aggressive to fit the run also opens up play action risks. Neither fitting the Mike inside nor outside of the fullback may be optimal for the defense. 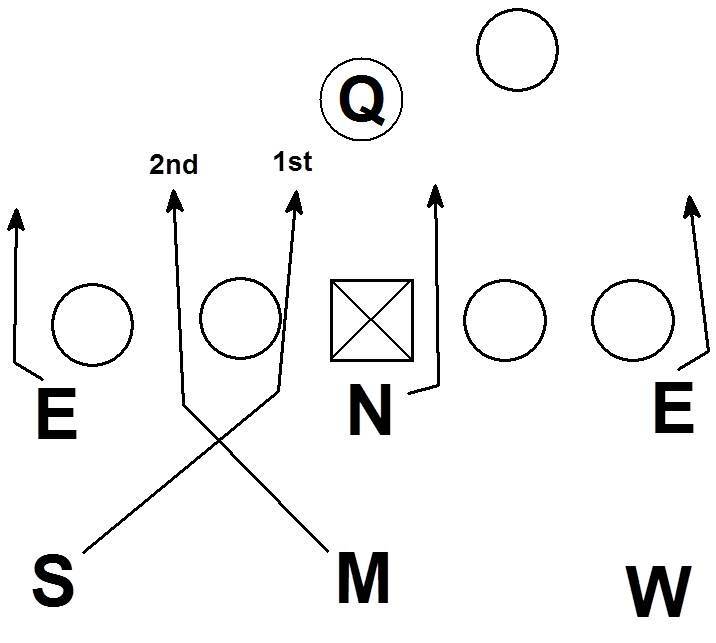 "The DT needs to squeeze the guard's block and reduce the A gap." 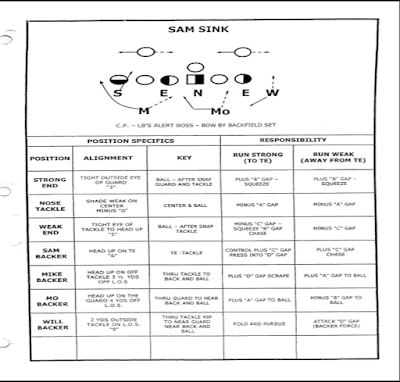 "The Nose needs to control the scoop block, keeping the offensive lineman on the line of scrimmage longer. That buys time for the Will." "The Mike needs to be violent and jam the fullback back in the hole." "The Will needs to read his key and be quick to attack the ISO." These are all true. The issue is that may be easier said then done. Especially when playing good teams. If you want to compete for conference and post-season titles you are going to have to play and beat good teams. What is the solution when their fullback is better than your Mike? 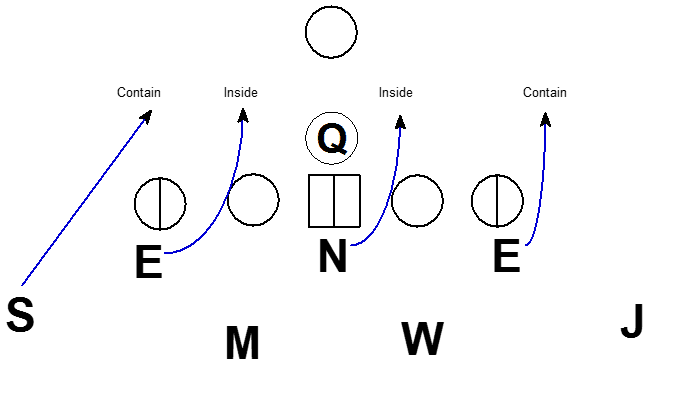 What if the guard is getting movement on the DT consistently? Being able to change how the defense fits the run can help give the defense solutions to these problems. Here the defense bumped the linebackers strong and is using the WS as the third LB. With the Will bumped over the Center the Mike and Will have much easier time bracketing the fullback's block. 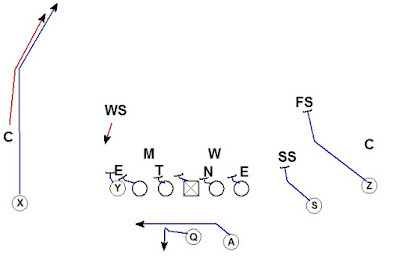 The offense does not have an easy angle to block the Mike or Will. 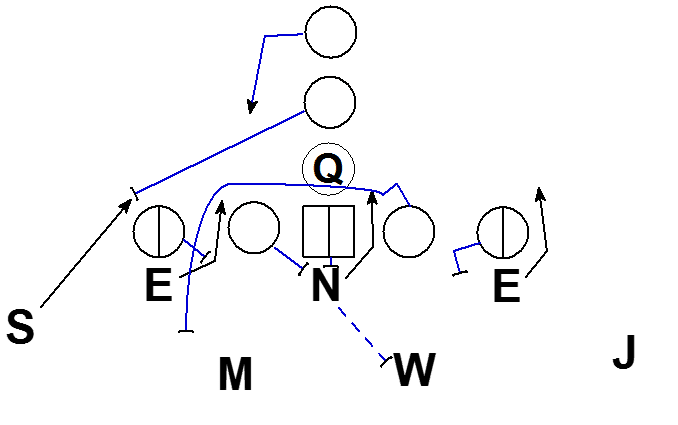 When the offense is using an offset fullback or an unbalanced set, the defense can sure up run fits by bumping to a 4-3 run fit. Having the linebackers bumped can help get players to the point of attack. 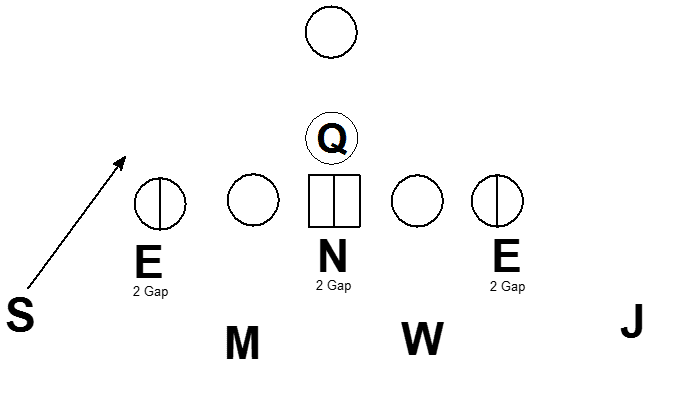 The offense most likely wants to run toward the offset fullback. It makes sense to get extra defenders where the offense wants to run the ball. Here is an unbalanced formation. The offense most likely wants to run toward the unbalanced side. 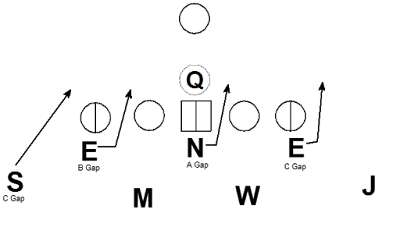 Being able to bump to a 4-3 run fit can help the defense remain gap sound even against the extra gaps created by the unbalanced formation. TCU coach Gary Patterson wrote about the concept of bumping in the 4-2-5 in his article for Nike Coach of the Year. 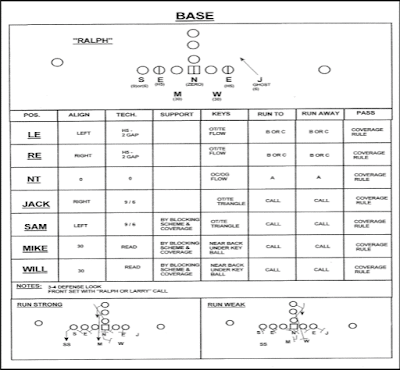 On pages 6,7,8 of the article Coach Patterson explains TCU's slide and scoot concepts. 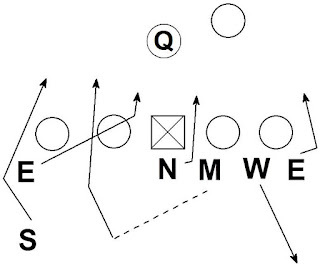 There are other times when the defense wants to fit like a 4-4. Here the defense is in a 4-3 run fit. 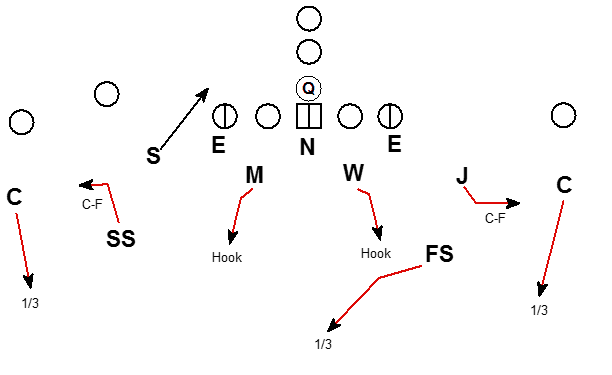 If the offense is running a read power to the weak side the defense may have difficulty. 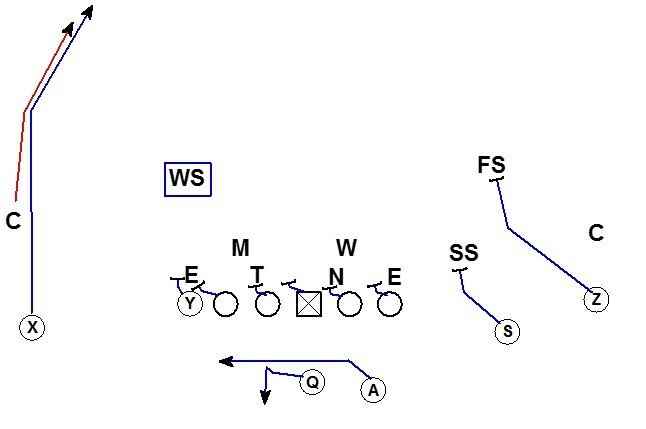 The WS has a poor angle to force the wide path of the lead blocker. 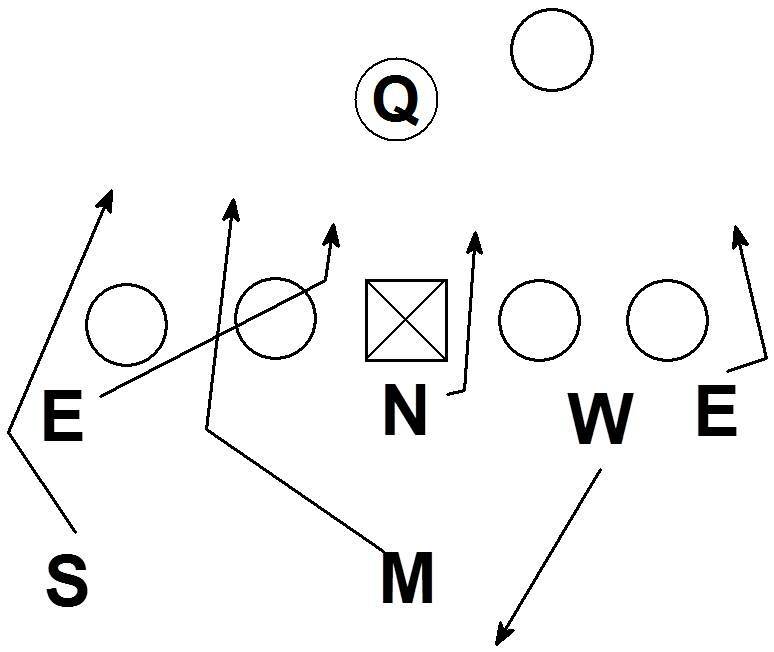 If the End steps down with the down block of the OT, the Will LB ends up in a 1 on 1 foot race with the RB. This may be a bad match up. 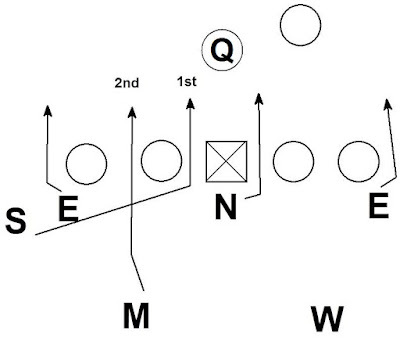 If the defense is fitting the run like a 4-4, the angles are much easier for the defense. The WS has a natural force leverage from width on the lead blocker. The Will LB can much more easily scrape over the top of the DE and pursue the RB. The 4-2-5 has the added advantage of disguise. On any play the LB's could bump during the cadence. Any of the three safeties could move into the role of the third linebacker. The defense can also show a 4-3 fit and bump back into a 4-4 run fit. 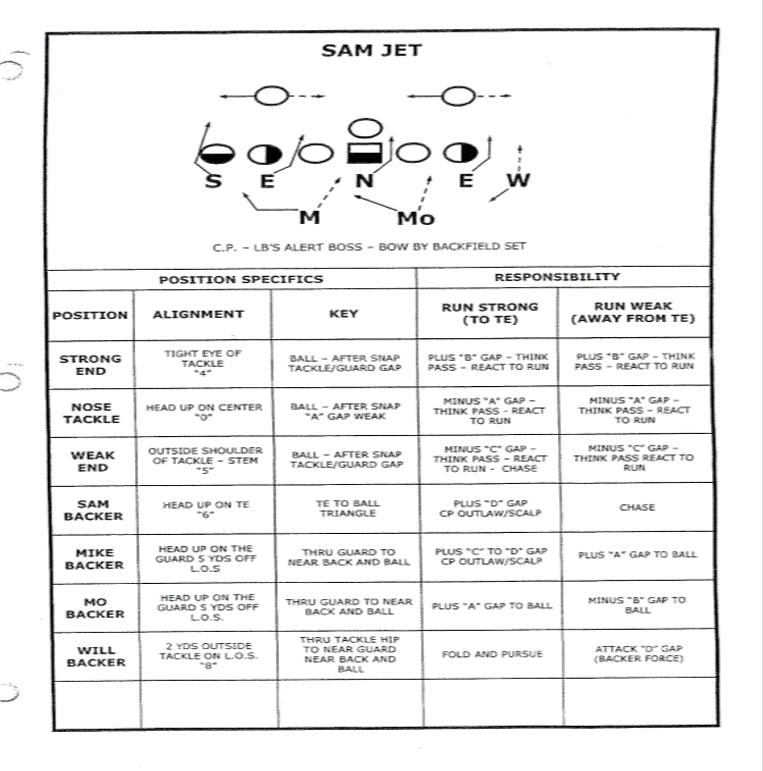 The result is offenses being forced to constantly identify, communicate, and react to a defense changing it's run fits. The versatility and flexibility are major contributing factors in the success and popularity of the 4-2-5. I'm going to continue the Basics of the 4-2-5 series this off-season as I have time. If there is anything you would like to see, drop a comment or send me an e-mail. 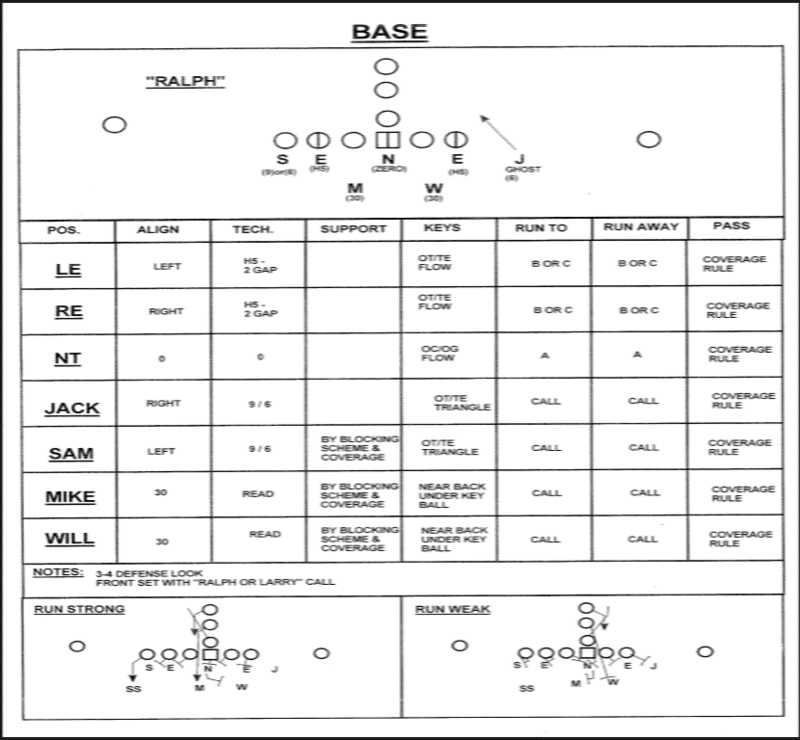 Interesting article by Barry Hoover about evaluating offensive efficiency in the red zone. This type of statistical tool is good for self-scouting your offense or evaluating your defense against opposing teams. Coach Hoover is also the author of the Coach Hoover website. The previous post video has been blocked. Here is the same video directly from the Seahawks. This concept is a Run Pass Option (RPO) play that combines outside zone blocking with a post route. 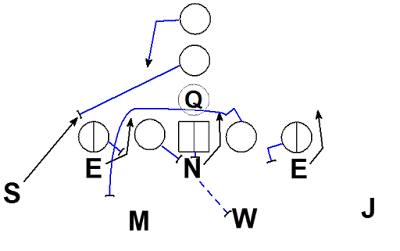 Here the concept is being run from 11 personnel and is attacking the weak side of a 4-2-5 quarters coverage defense. 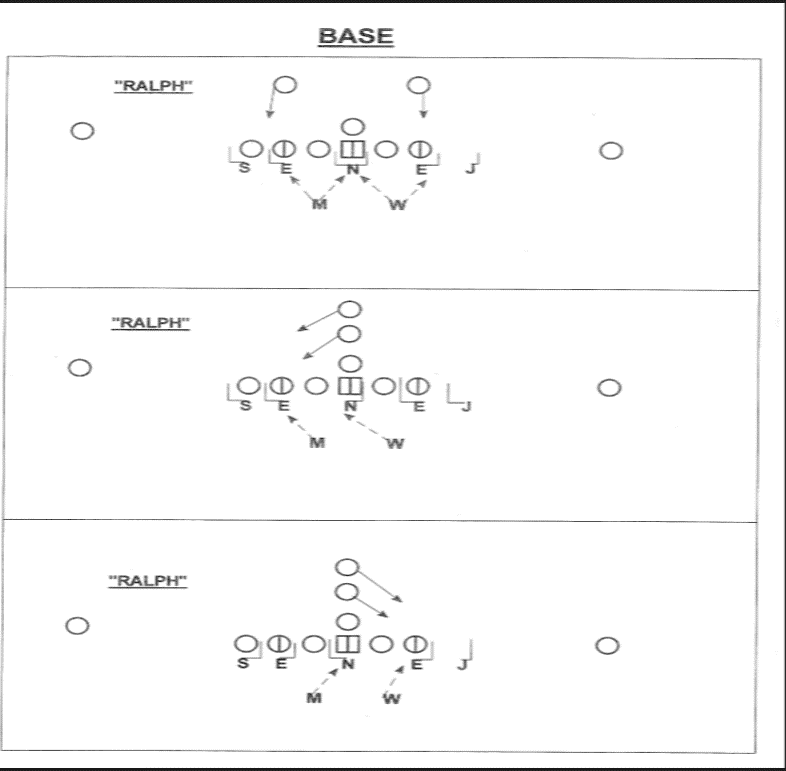 The OL and Y are blocking outside zone (stretch) with even numbers (6 vs 6). The Defense has the advantage of being +1 as soon as the WS reads the TE is blocking and gets into a run fit. This concept is designed to read the weak safety. 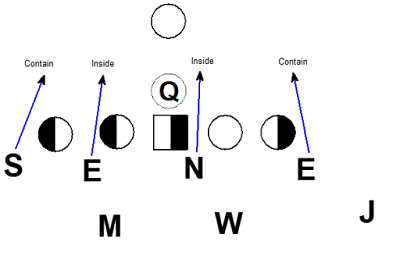 The QB will shuffle while meshing with the RB. The QB's vision is on the WS. 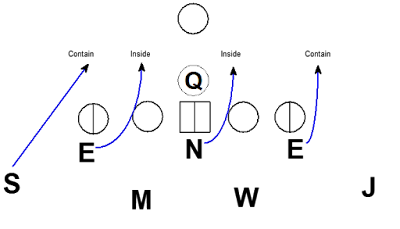 If the QB reads the WS coming downhill into the run game, the QB will pull back and throw the skinny post. 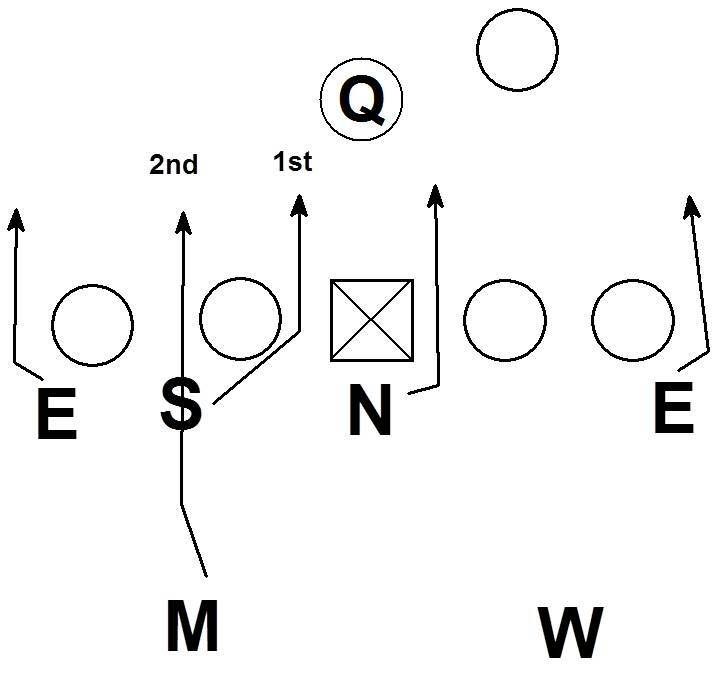 The post is leaning his outside shoulder on the corner before breaking the route deep and skinny. 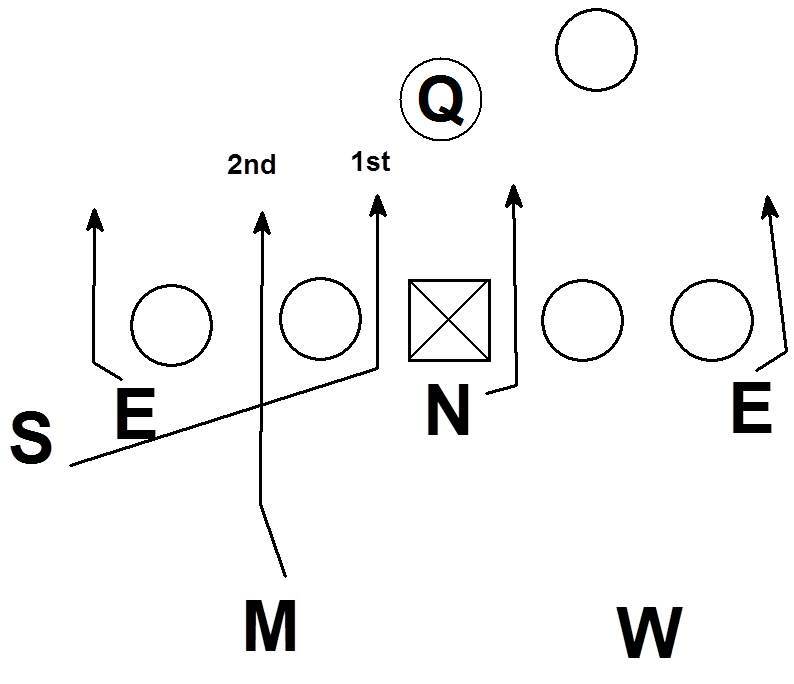 The goal is for the WR to win the 1 on 1 against the corner who has no post help. If the QB reads the WS not committing downhill to defend the run, the ball is handed off on the outside zone. This type of run pass option is safe way to take a shot. 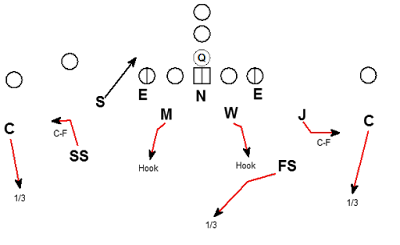 The play has a chance to be a homerun post or an efficient run.